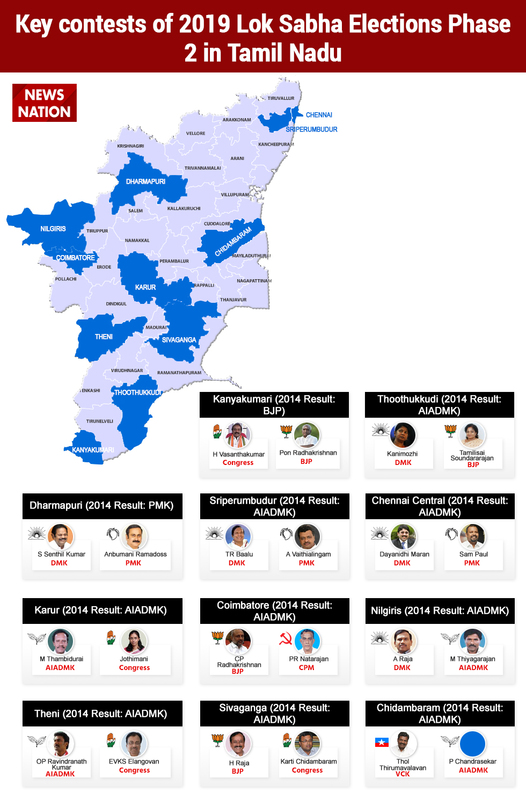 Some of the key constituencies in the second phase of elections are Chennai Central, Coimbatore, Dharmapuri, Sivaganga, Thoothukkudi and Kanyakumari in Tamil Nadu. 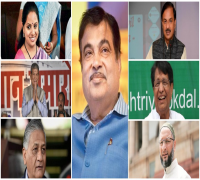 BJP candidate Hema Malini, Congress leader Ashok Chavan, DMK leader Kanimozhi, NC leader Farooq Abdullah, JDS leader HD Deve Gowda, AIADMK's M Thambidurai and Congress leader Sushilkumar Shinde. Lok Sabha Elections 2019: Voters in 95 constituencies will use their franchise on April 18 in the second phase of the 2019 Lok Sabha Elections. 12 states and Union Territories will go for polls in the second phase. The voting process will be completed in Tamil Nadu (39 seats), barring Vellore where the voting has been cancelled by the Election Commission, Puducherry (1 seat) and Manipur (2 seats). Other states which are going for polls are Karnataka (14/28 seats), Maharashtra (10/48 seats), Uttar Pradesh (8/80 seats), Bihar (5/40 seats), Assam (5/14 seats), Odisha (5/21 seats), West Bengal (3/42 seats), Chhattisgarh (3/11 seats) and Jammu and Kashmir (2/6 seats). The poll panel has decided to postpone the polling date of Tripura East seat to April 23 from April 18 due to law and order problem. 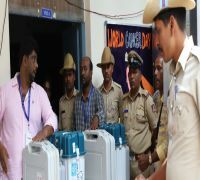 Some of the key constituencies in the second phase of elections are Chennai Central, Coimbatore, Dharmapuri, Sivaganga, Thoothukkudi and Kanyakumari in Tamil Nadu, Tumkur, Bangalore North, Bangalore South, Mysore and Mandya in Karnataka, Nanded and Solapur in Maharashtra, Agra, Mathura and Fatehpur Sikri in Uttar Pradesh, Silchar and Mangaldoi in Assam, Bolangir and Sundargarh in Odisha, Srinagar and Udhampur in Jammu and Kashmir, Banka and Katihar in Bihar, Darjeeling and Raiganj in West Bengal and Rajnandgaon in Chhattisgarh. 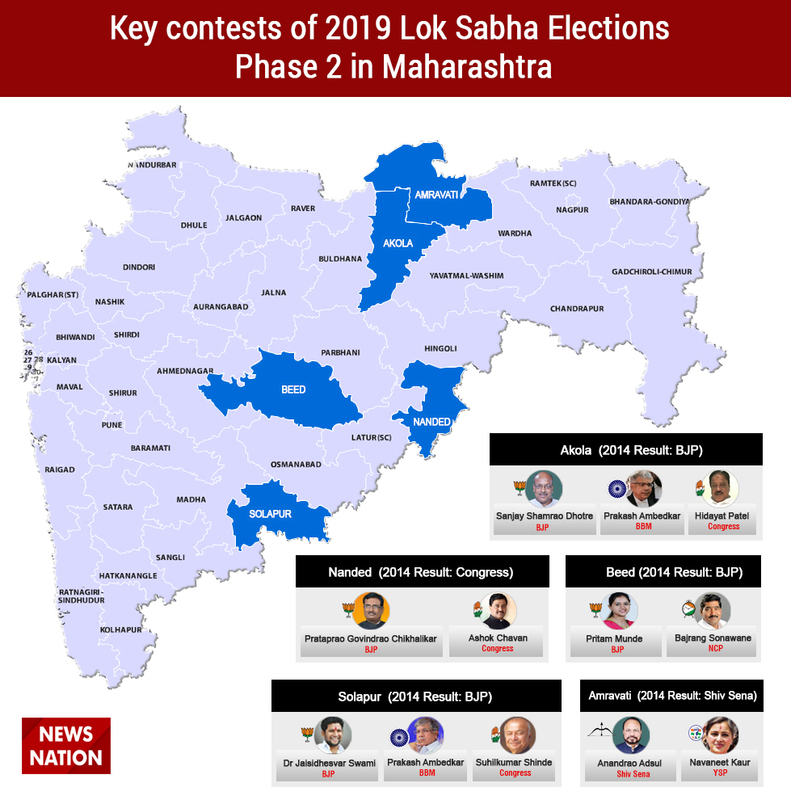 Several prominent candidates are in the fray in the second phase of elections - Hema Malini, Raj Babbar, Farooq Abdullah, Ashok Chavan, Sushilkumar Shinde, Prakash Ambedkar, DV Sadananda Gowda, Tejaswi Surya, BK Hariprasad, HD Deve Gowda, Veerappa Moily, Shobha Karandlaje, Prajwal Revanna, KH Muniyappa, Pritam Munde, Jay Prakash Narayan Yadav, Tariq Anwar, Deepa Dasmunshi, Md Salim, Jitendra Singh, Kalikesh Singh Deo, Jual Oram and Kunwar Danish Ali. Let's see the state-wise key constituencies and prominent candidates in detail. Former Union minister and DMK candidate Dayanidhi Maran will face PMK's Sam Paul in Chennai Central. In 2014, AIADMK's SR Vijayakumar won the seat for the first time for the party and defeated Maran with over 45,000 votes. Chennai Central has been the bastion of DMK over the years. In the last seven elections, the DMK won the seat 5 times in a row in 1996, 1998, 1999, 2004 and 2009. Dayanidhi won the seat twice in 2004 and 2009 whereas his father Murasoli Maran won it thrice in 1996, 1998 and 1999. The DMK has fielded its senior leader and former Union minister TR Baalu from Sriperumbudur this time. Baalu won the election from the same constituency in 2009. However, in 2014 the party lost the seat to the AIADMK when its candidate Ramachandran defeated DMK's Jagathrakshakan by more than 1 lakh votes. In the last seven elections, the DMK won it four times in 1996, 1999, 2004 and 2009 whereas the AIADMK won the seat in 1998 and 2014. The Congress also emerged victorious from the constituency thrice in a row in 1984, 1989 and 1991. PMK's Anbumani Ramadoss will try to retain his seat this time also as he is facing a tough battle from DMK's Senthil Kumar. Ramadoss defeated AIADMK's PS Mohan in 2014 with a handsome margin of more than 77,000 votes. In the last seven elections, the PMK won the seat four times in 1998, 1999, 2004 and 2014. The AIADMK last won the seat in 1989 whereas the DMK was successful in 2009. The DMK has again fielded A Raja from Nilgiris who lost the seat in 2014. AIADMK's Gopalakrishnan humbled Raja with a margin of over 1 lakh votes in the 2014 Lok Sabha polls. In the last seven elections, the DMK won the seat only once in 2009 whereas the BJP was successful twice in 1998 and 1999. Congress candidate R Prabhu represented the seat five times in 1980, 1984, 1989, 1991 and 2004. Coimbatore is one of the seats in the state where the BJP has been in a strong position and even its candidate CP Radhakrishnan won it twice in 1998 and 1999. In 2014, Radhakrishnan was defeated by AIADMK's Nagarajan by over 40,000 votes. Radhakrishnan will be facing CPM's Natarajan this time who represented the constituency once in 2009. Lok Sabha Deputy Speaker M Thambidurai is locked in an intense battle with Congress-DMK combine's Jothimani in Karur. Thambidurai won the seat with a massive margin in 2014 and represented the seat in 1989, 1998 and 2009 also. The DMK won the seat only once in 2004. VCK chief Thirumavalavan is again trying his luck from Chidambaram after he was defeated by the AIADMK in the 2014 elections. Thirumavalavan represented the seat in 2009 whereas the PMK won the seat thrice in a row in 1998, 1999 and 2004. Former Union minister P Chidambaram's son Karti will have to face BJP's firebrand leader H Raja from Sivaganga this time. In 2014, both Karti and Raja lost the election to AIADMK's Senthilnathan. P Chidambaram represented the seat for a record seven times in 1984, 1989, 1991, 1996, 1998, 2004 and 2009. He was the member of GK Moopanar's Tamil Maanila Congress in 1996 and 1998. Congress leader Elangovan has been pitted against AIADMK's Ravindranath Kumar in Theni. The AIADMK won the seat in 2014 when its candidate Parthipan defeated the DMK with a huge margin of over 3 lakh votes. The Congress won the seat in 2009. Thoothukkudi will see the clash of titans as M Karunanidhi's daughter Kanimozhi will be contesting her maiden Lok Sabha elections against BJP state president Tamilisai Soundararajan. The AIADMK was the successful party in 2014 when Jeyasingh Thiyagaraj defeated DMK's P Jegan by more than 1 lakh votes. The DMK won the seat in 2009. Union Minister Pon Radhakrishnan is taking on Congress candidate Vasanthakumar from Kanyakumari. Radhakrishnan won the seat in 2014 with an impressive margin of over 1,25,000 votes. Before the delimitation process in 2009, the seat was known as Nagercoil and Radhakrishnan represented it in 1999. Congress leader N Dennis represented the seat six times in a row in 1980, 1984, 1989, 1991, 1996 and 1998 before his defeat at the hands of Radhakrishnan in 1999. KH Muniyappa of Congress has been winning the Kolar seat since 1991 and will try to win it for a record eighth term. In 2014, Muniyappa defeated JDS candidate Kolar Kesava by over 47,000 votes. BJP has fielded S Muniswamy against Muniyappa this time. The Congress-JDS combine is bracing for a tough contest in Mandya after the BJP has taken a decision to support independent candidate Sumalatha Ambareesh. In the last seven elections, Ambareesh won the seat thrice in 1998, 1999 and 2004. The Congress decided to leave the seat for HD Deve Gowda's grandson Nikhil Gowda and denied ticket to Ambareesh's wife Sumalatha. 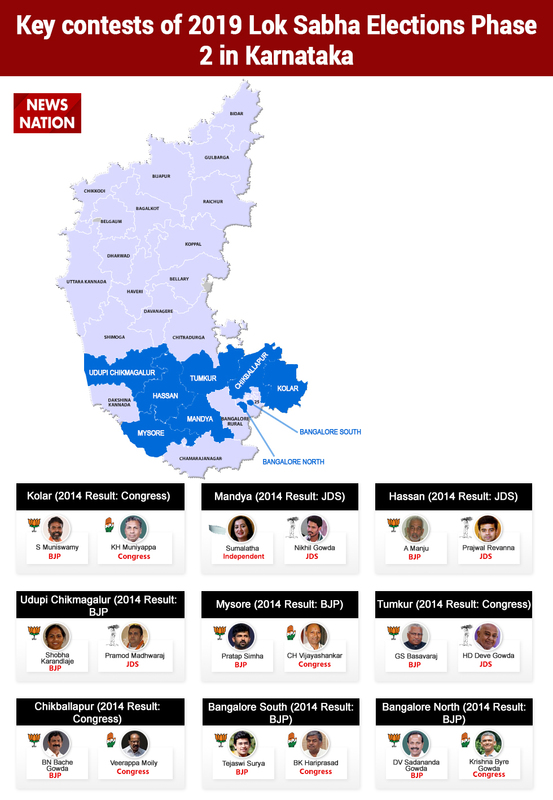 In 2014, JDS candidate CS Puttaraju defeated Congress candidate Ramya, who won the seat in a 2013 bypoll, by a slim margin of over 5,000 votes. JDS supremo and former prime minister HD Deve Gowda has left his stronghold Hassan for his grandson Prajwal Revanna. Deve Gowda represented the seat five times in 1991, 1998, 2004, 2009 and 2014. In 2014, Deve Gowda defeated BJP's A Manju by over 1 lakh votes. In 1999, Putta Swamy Gowda defeated Deve Gowda and wrested the seat for the Congress party. The BJP never won the seat. BJP's Shobha Karandlaje will be locking horns with JDS candidate Pramod Madhwaraj this time in Udupi-Chikmagalur. In 2014, Karandlaje defeated Congress party's Jayaprakash Hegde by a handsome margin of more than 1,80,000 votes. In 2009, BJP's DV Sadananda Gowda won the seat but Jayaprakash Hegde won it for the Congress party in a 2012 bypoll. BJP's Pratap Simha is again contesting from Mysore and facing former BJP leader CH Vijayashankar. In 2014, Simha defeated Congress candidate AH Vishwanath by over 30,000 votes. The JDS candidate got more than 1,35,000 votes that time. Vijayashankar won the seat twice in 1998 and 2004 on a BJP ticket whereas Congress party's Srikanta Datta Narsimharaja Wadiyar represented the seat in 1984, 1989, 1996 and 1999. Former prime minister HD Deve Gowda is locked in a difficult contest against BJP's GS Basavaraj in Tumkur. In 2014, the seat was won by the Congress candidate when Muddahanumegowda defeated BJP's Basavaraj by over 74,000 votes. Basavaraj represented the seat four times in 1984, 1989 and 1999 as a Congress candidate and in 2009 as a BJP candidate. BJP's S Mallikarjunaiah won the seat thrice in 1991, 1998 and 2004. Senior Congress leader and former Union minister Veerappa Moily managed to win Chikballapur in 2014 with a slim margin of over 9,000 votes against BJP's BN Bache Gowda. Moily will be facing Gowda yet again. The BJP never won the seat in its electoral history whereas the Congress lost it only once in 1996. Moily won the seat in 2009 also while RL Jalappa represented the seat four times in a row in 1996 on a Janata Dal ticket and in 1998, 1999 and 2004 on a Congress ticket. Bangalore South will witness an interesting contest between BJP's young candidate Tejaswi Surya and senior Congress leader BK Hariprasad. Former Union minister Ananth Kumar won the seat six times (1996, 1998, 1999, 2004, 2009 and 2014) in a row before his death. In 2014, Ananth Kumar defeated Congress party's Nandan Nilekani by a massive margin of over 2,28,000 votes. The BJP won the seat for the maximum number of times and is considered as one of the strongholds of the party. The BJP has been winning the Bangalore North seat since last three elections and Union Minister and former chief minister DV Sadananda Gowda won it in 2014. Gowda defeated Congress candidate Narayana Swamy by close to 2,30,000 votes. Congress veteran CK Jaffer Sharief represented the seat for the party seven times in 1977, 1980, 1984, 1989, 1991, 1998 and 1999. BJP's Sanjay Shamrao Dhotre has been representing the Akola parliamentary seat since 2004. The saffron party won the seat in 1989, 1991 and 1996 also. Prakash Ambedkar is again contesting the seat which he represented in the past in 1998 and 1999. Nanded has been one of the bastions of the Congress party in Maharashtra. In the last seven elections, the party lost the seat only once in 2004 when BJP's Digamber Bapuji Patil stunned everyone. In 2014, Congress leader and former Maharashtra chief minister Ashok Chavan defeated BJP candidate DB Patil by over 80,000 votes. Chavan is a Congress candidate once again. In 2014, BJP's Gopinath Munde won the Beed Lok Sabha seat second consecutive time with a margin of over 1,36,000 votes. However, Munde died in a road accident and his daughter Pritam Munde contested the bypoll and defeated her nearest rival with a massive margin. Pritam is again contesting from the seat and will be facing NCP's Bajrang Sonawane. In the last eight elections, the BJP won the seat six times whereas the Congress won it in 1991. In a big political upset, BJP's Sharad Bansode defeated Congress stalwart Sushilkumar Shinde by close to 1,50,000 votes in 2014. Shinde represented the seat thrice in 1998, 1999 and 2009. The BJP won the seat in 1996 and 2004 also. Amravati has been Shiv Sena's stronghold since 1996. The party represented the seat in 1996, 1999, 2004, 2009 and 2014. Party leader Anandrao Adsul defeated NCP's Navneet Ravi Rana by over 1,37,000 votes in 2014. Adsul will be facing Navneet again. Congress leader Raj Babbar will be taking on BJP's Raj Kumar Chaher and BSP's Shreebhagwan Sharma in Fatehpur Sikri this time. Earlier, the party fielded Babbar from Moradabad but the leader asked the party to change his seat. In 2014, BJP's Choudhary Babulal defeated BSP's sitting MP Seema Upadhyay by a massive margin of over 1,73,000 votes. The party has decided to change the candidate this time. BJP's Hema Malini will try to retain her seat against RLD's Narendra Singh and Congress candidate Mahesh Pathak. In 2014, Malini defeated RLD leader and Ajit Singh's son Jayant Chaudhary with a huge margin of over 3,30,000 votes. Chaudhary is contesting from his family bastion Baghpat this time. In the last seven elections, the BJP captured the seat five times in 1991, 1996, 1998, 1999 and 2014. The Congress won the seat in 2004 whereas RLD's Chaudhary won the seat once in 2009 in an alliance with the BJP. Saffron party's Chaudhary Tejveer Singh represented the seat thrice in the Lok Sabha. 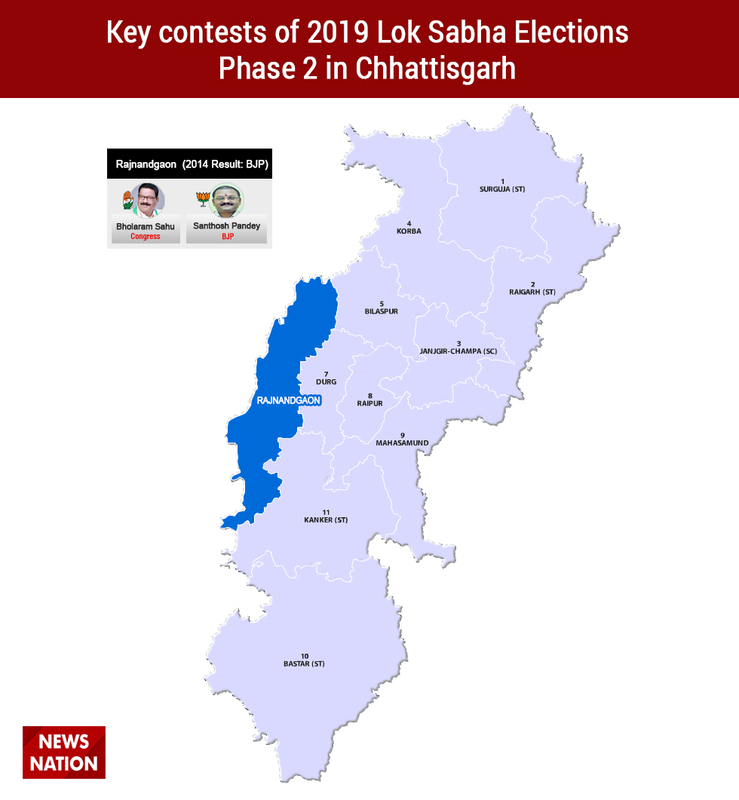 BJP's Ram Shankar Katheria won the Agra Lok Sabha seat decisively in 2014 for the second consecutive time when he defeated BSP's Narayan Singh Suman with a massive margin of over 3 lakh. Samajwadi Party's Raj Babbar won the seat in 1999 and 2004 whereas BJP's Bhagwan Shankar Rawat represented the seat thrice in 1991, 1996 and 1998. However, the party decided to field SP Singh Baghel from Agra this time and shifted Katheria to Etawah. BJP's sitting MP Kanwar Singh Tanwar will try to retain his seat against BSP leader Danish Ali and Congress candidate Sachin Choudhary. Earlier, the Congress fielded Rashid Alvi from the seat but later he was replaced with Choudhary. Ali was with the JDS before joining the BSP. In the last seven elections, the BJP represented the seat thrice in 1991, 1998 and 2014. Former cricketer Chetan Chauhan won the seat for the saffron party twice. The SP, the BSP and the RLD won the seat in 1996, 1999 and 2009 respectively. 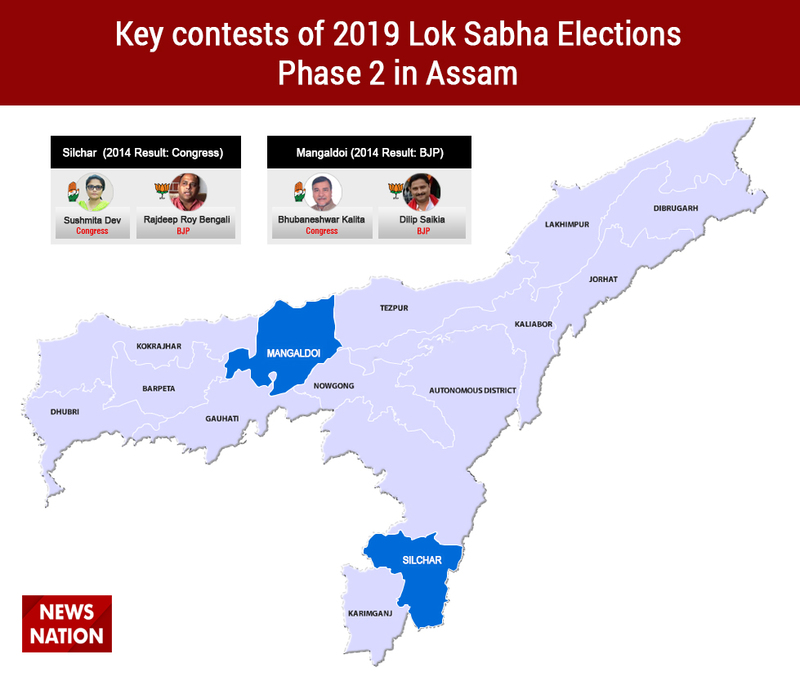 In 2014, Congress leader and party stalwart Santosh Mohan Dev's daughter Sushmita Dev won Silchar when she defeated BJP's Kabindra Purkayastha by a margin of over 35,000 votes. Sushmita is taking on BJP's Rajdeep Roy Bengali this time. Purkayastha won the seat for the saffron party thrice in 1991, 1998 and 2009 whereas Santosh Mohan dev represented the constituency five times in 1980, 1984, 1996, 1999 and 2004. The BJP has fielded Dilip Saikia this time from Mangaldoi instead of its sitting MP Raman Deka. In 2014, Deka defeated Congress leader Kirip Chaliha by over 22,000 votes. Deka represented the seat twice in 2009 and 2014. In the last seven elections, both the BJP and the Congress won the seat three times each whereas the AGP won the seat once in 1996. In the last seven elections, BJP leader and Union Minister Jual Oram represented Sundargarh four times in 1998, 1999, 2004 and 2014. Oram won the seat in an alliance with the Naveen Patnaik-led BJD everytime barring 2014. 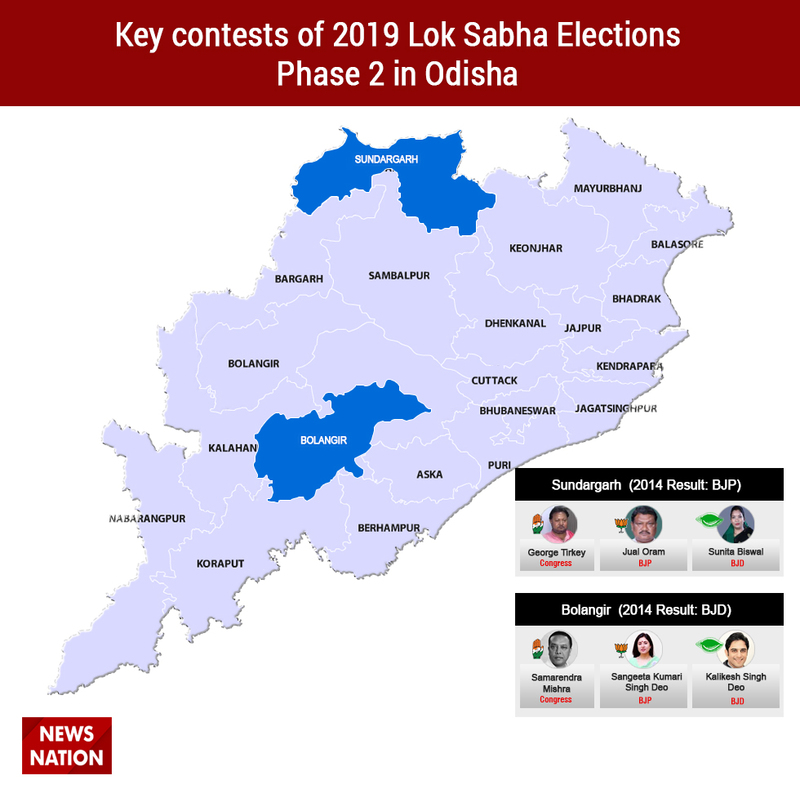 In the last LoK Sabha polls, Oram defeated BJD's Dilip Kumar Tirkey and Congress veteran Hemananda Biswal. The BJD has decided to field Biswal's daughter Sunita from Sundargarh this time. BJP's Sangeeta Kumari Singh Deo and BJD's Kalikesh Singh Deo have been again pitted against each other by their respective parties in Bolangir. Sangeeta won the seat thrice in 1998, 1999 and 2004 whereas Kalikesh represented the seat twice in 2009 and 2014. In 2014, Kalikesh defeated Sangeeta by over 1 lakh votes. The Congress is also trying to win the seat this time by fielding Leader of Oppostion in Odisha Assembly Narasingha Mishra's son Samarendra. 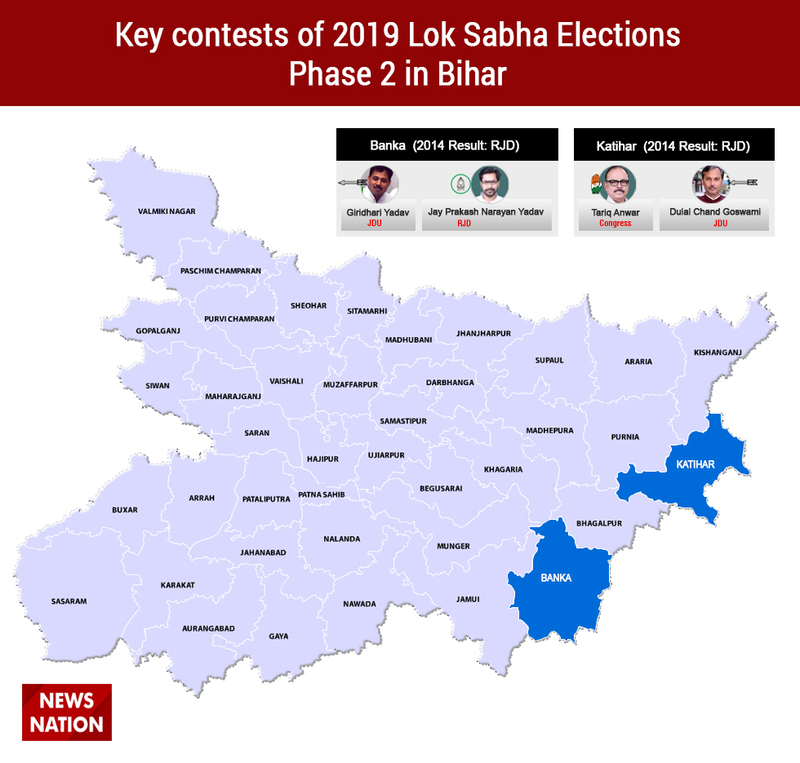 Banka will see a triangular contest this time with JDU's Girdhari Yadav, RJD's sitting MP Jay Prakash Narayan Yadav and rebel BJP leader Putul Kumari Singh are in the fray. In 2014, Jay Prakash defeated Putul Kumari by a slim margin of over 10,000 votes. Putul's husband Digvijay Singh represented the seat thrice in 1998, 1999 and 2009. She won the seat in a bypoll in 2010 after the death of Singh. The RJD represented the seat twice in 2004 and 2014. Tariq Anwar represented Katihar five times in the Lok Sabha in 1980, 1984, 1996, 1998 and 2014. Anwar is again trying his luck from the constituency. BJP's Nikhil Kumar Choudhary won the seat thrice in a row in 1999, 2004 and 2009. In 2014, Anwar contested the elections on an NCP ticket and defeated Choudhary by over 1,14,000 votes. The BJP will be facing a tough task to retain Darjeeling this time after the split in the GJM. The party won the seat in 2009 and 2014 with the GJM's backing. Jaswant Singh won the seat in 2009 whereas SS Ahluwalia retained it for the party in 2014. However, the saffron party has fielded Raju Singh Bisht to take on Trinamool's Amar Singh Rai and CPM's Saman Pathak. In the last seven elections, the CPM won the seat thrice in 1996, 1998 and 1999. In 2014, Raiganj was one of the two seats won by the CPM in the state. Party's Md Salim defeated Congress candidate and Priya Ranjan Dasmunshi's wife Deepa Dasmunshi in a very close contest with over 1,600 votes. Salim will be facing Deepa again this time with BJP's Deboshree Chaudhary and Trinamool's KL Agarwal are also in the fray. Priyaranjan Dasmunshi won the seat twice in 1999 and 2004. The BJP won the seat six times in 1989, 1996, 1999, 2004, 2009 and 2014. BJP's Abhishek Singh won the seat in 2014 by over 2,30,000 votes. His father and former Chhattisgarh chief minister Raman Singh represented the seat in 1999. Srinagar has been National Conference's stronghold over the period and the party won it 10 times. 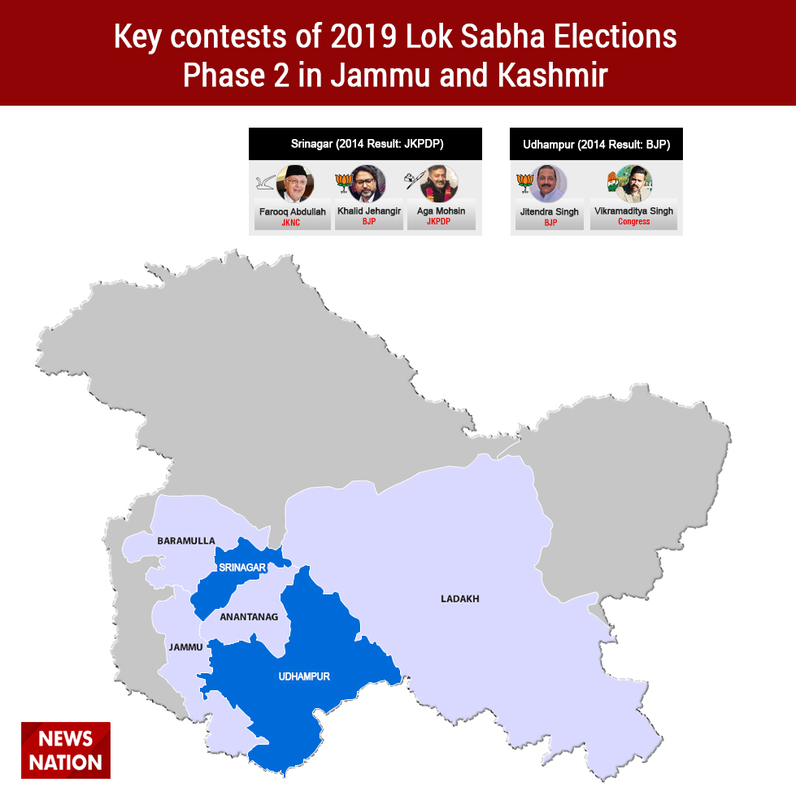 The PDP won the seat for the first time in 2014 when party's Tariq Hameed Karra defeated National Conference leader and former Jammu and Kashmir chief minister Farooq Abdullah by over 40,000 votes. However, Abdullah made a comeback in a bypoll in 2017 after Karra's resignation from the party and the Lok Sabha. Omar Abdullah represented the seat thrice in 1998, 1999 and 2004. Udhampur has been one of the strongholds of the BJP in the state. The party won the constituency four times in 1996, 1998, 1999 and 2014. BJP's Jitendra Singh defeated Congress party's senior leader and stalwart Gulam Nabi Azad by over 60,000 votes. BJP's Chaman Lal Gupta won the seat for three times in a row.